Please ignore the bad lighting and the fact that I would NEVER actually tuck this top into this skirt in this fashion--how's my hemline? Oh how I hate hemming! I feel like I can never get the length quite right. 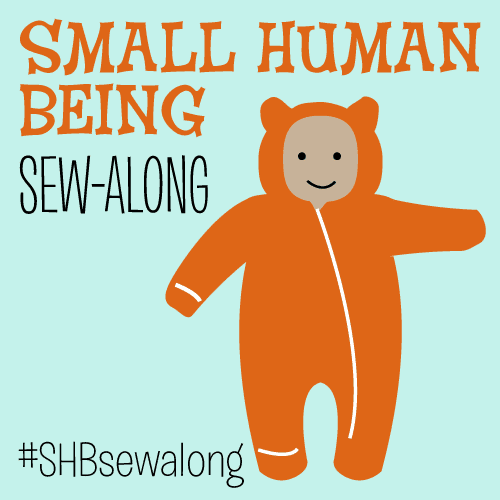 I know many reputable sewing experts say you need a helping hand for proper skirt hemming. But Masheka is no hemming expert, I don't really trust Matilda, and with my waistless 33-weeks-pregnant belly, I have a hard time figuring out where the TOP of the skirt should sit, never mind the bottom. So my skirts always seem to end up oddly long or oddly short. Anyway, I managed to take a half-hour break from decluttering and iron and pin a 3 1/2" hem on both sub-skirts of my reversible shirred skirt. I used my usual not-so-accurate method--looking in the mirror and bending over as best I could and playing with pins until it sort of looked ok--to determine that amount. What do you think? Should I go ahead and sew this baby up? I'm aiming for a just-below-the-knee look. Here are side and back views--and no, I don't have frighteningly large elbows, that's just a perspective error. I had hoped to wear it to work today, but instead I went for a navy, red and white combo (partly inspired by Susannah's Fashion on the Ration color scheme). I used to worry that red and blue together would make me look like I was dressed up for the Fourth of July, but I first tried wearing red pants with this same navy and white polka dot top about a year ago and fell in instant color scheme love. Red plastic beaded necklace from cheapo costume jewelry store. Cost: $4. Cost per wear: 10 cents. Blue cotton LOFT maternity cardigan: gift from Mom Cost: Free. Blue fake leather belt from random NYC discount store. Cost: $10. Cost per wear: $1.42. Gray lacy camisole: LOFT. Cost: $14. Cost per wear: 35 cents. Navy and white knit polka dot wrap top, LOFT. Cost: $20 (sale rack). Cost per wear: 66 cents. Red knit skirt, thrifted. Cost: $2. Cost per wear: 5 cents. Purple nubuck flats: Privo by Clarks. Cost: $80. Cost per wear: $4.40. Total Cost Per Wear (so far): $6.98. Knits are a pregnant girl's best friend! The only genuine maternity-wear item in this outfit is the cardigan--the rest are all just stretchy items I've had for ages. 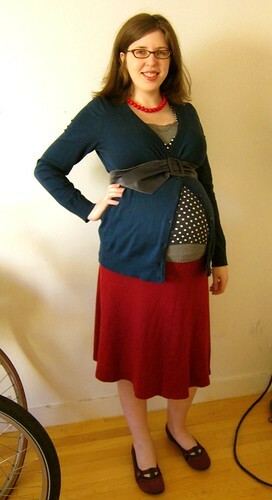 And the cardigan is actually a bit on the loose side even at 33 weeks, hence the belt. Yes, I probably should have ironed this, but that would be deceptive--I rarely iron knits, even when they need it. P.S. In case you're wondering, yes--I got a haircut! But don't worry--I made sure it was still long enough for a lazy ponytail. This could just be me, but I think that the skirt could bear to be another .5 -.75 inches shorter. It looks adorable, though. I love that print! You could safely leave it as-is, but I feel that that that little bit would put you at the optimal, smallest part of the leg, just beneath the knee zone. Granted, going back and adjusting that eensy bit on two layers of skirt could be more effort than its worth. The haircut looks great, by the way! I think it looks good, and since it'll be shifting over the rest of the pregnancy I say go for it. Are you going to leave it easy to rehem? I imagine post-pg you'll have to re-do it! And I hear you on the hems -- it's a real struggle for me, Evan hates helping me! I really want one of those hem markers, but the older metal ones, not the new plastic ones. One of these days! Is your mom available to come down and help you hem it? Honestly, that's the only way I ever get a good hem is to have my mom do it with (for) me. I love the length of the red skirt, though. Is there any way to lay one on top of the other and use that as a guide? b) you could pull the skirt up a bit higher on that side. Overall, ADORABLE! I think the shirring it working great for your lovely bump. Krista, I think I just might not be wearing it evenly. And Heather, I only wish my mom lived close by, as she helped me hem my last dress--right now she is five hours away! I'm going to go for it. And I'm going to make it easy to pick out and rehem for post-pregnancy, too. It doesn't look to me like your waistband is straight. It may be just the photos, but it looks to me like the waistband of the skirt is about 1/2 an inch or an inch higher of your left hip. I think you're right, Sophie--I was in such a rush to take photos that I didn't sit it properly at my "waist"... Like I said, it's a bit hard when there isn't an actual natural waist for it to settle at! I think you should just hem it and not worry about it. Like you've already said, make it easy to unpick post-preg since the skirt's going to sit totally differently on you then. I have to admit I never really look in the mirror to see if my hem looks even. I just hem... and it's turned out pretty well so far. Maybe I should give a bit more thought to it next time.